Last Monday I joined the Space Coast Birding and Wildlife Festival pelagic trip out of Ponce Inlet. This was my second trip on the Pastime Princess, following my first pelagic back in September 2011. I wanted to try to track the trip on a map, so I looked into how to use the GPS on my iPhone without having network connection. I learned that if the area to be visited is cached in the iPhone’s native Maps app, the GPS will be able to find the present location on the map. (I am still on IOS 5.1.1 so I was using the iPhone Maps app powered by Google maps.) The day before the pelagic, I spent a few minutes zooming in and out of the Atlantic Ocean off the coast of Volusia and Brevard counties on my iPhone to get as much information into the cache as possible. There are applications that can use cached maps in coordination with GPS to make a line that tracks a journey, but I figured this might be a battery drain. So instead, I planned to drop pins on the map as we went. However, I learned just a bit too late (on the boat, at sea!!) that the app won’t hold more than one pin. I could have saved locations as bookmarks, but that seemed cumbersome. So, plan B. I checked our location every hour or so using the Maps app. 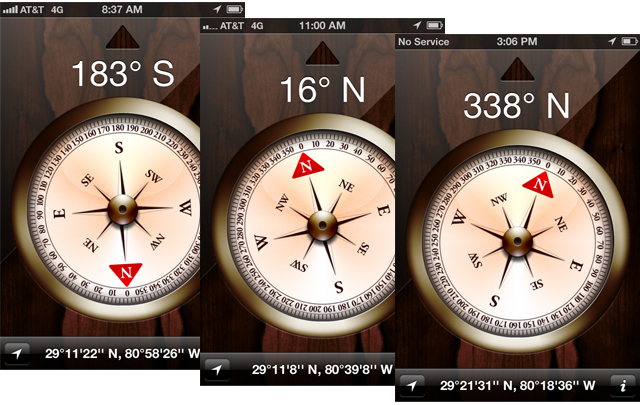 It takes a few moments for the phone to fix a location using just GPS, so I had to be patient. Once I knew that our location was found, I went to the native Compass app and took a screenshot. At the end of the day I had a list of coordinates that I plugged into a Google map when I got home. This map shows how we went. We actually started at Ponce Inlet which is by point N, but I didn’t start taking coordinates until we turned out to sea. For the first part of the trip we hugged the coast (so from N to A). This entry was posted in Festivals & Events, Pelagic, Space Coast Fest. Bookmark the permalink. Thanks SO much! This will be very helpful!